The La-7 was flown by the top Soviet ace of the war, Ivan Nikitovich Kozhedub. The Ukrainian-born Kozhedub, nicknamed “Ivan the Terrible”, a three-time Hero of Soviet Union, scored his last 17 air victories in 1945 in the La-7 numbered 27, which is now preserved in the Central Air Force Museum at Monino on the outskirts of Moscow. The last German aircraft that he shot down was the Messerschmitt Me-262, of Sergeant (German: Unteroffizier) Kurt Lange from 1./KG(J)54, over Frankfurt an der Oder on 15 February 1945. While the Yak-1’s fundamentally sound airframe lent itself to progressive improvements that culminated in the superb Yak-9 and Yak-3, it took a more radical step to turn the LaGG-3 into something more than a deathtrap: the replacement of its inline engine with Arkady Shvetsov’s M-82 radial. Ironically, other Soviet designers had experimented with the radial on their existing airframes, such as Mikhail Gudkov’s Gu-82, Mikoyan’s MiG-9, and Yakovlev’s Yak-7 M-82, while Lavochkin hesitated. By early 1942, only the Sukhoi Su-2 short-range bomber was using the M-82 when Lavochkin and Shvetsov were called in to a conference of the People’s Commissariat of the Aircraft Industry in Moscow. In essence, Lavochkin was told that reports on his LaGG-3 were so unsatisfactory that if something significant were not done soon, production of the fighter would have to be canceled. And since hundreds of unwanted M-82s were piling up at Shvetsov’s Plant No. 19 in Perm, Lavochkin was strongly urged to try fitting the radial in his plane. Lavochkin protested. Modifying the LaGG-3 airframe to take an air-cooled radial that was eighteen inches greater in cross section and 551 pounds heavier than the inline M-105P would be complicated by a shift in the center of gravity. The M-82’s propeller shaft could not accommodate a 20mm cannon. He also feared that production would cease before he and his design team would effect such complex alterations. There was already a precedent for such a fighter, however. As early as March 1941, Gudkov had lifted an M-82 directly from an Su-2 and had worked out a way of mounting it on a LaGG-3 airframe, and on October 12 the Commissariat announced a willingness to put his Gu-82 into production at the Gorky plant instead of the LaGG-3. Gudkov’s attention was then diverted by a project to mount a 37mm cannon to fire through the LaGG-3’s propeller hub, and the more resolute Aleksandr Yakovlev secured a contract to produce his new Yak-7B fighter at Gorky. News that LaGG-3 production at Plant No. 31 in Tbilisi was to be halted in April gave Lavochkin some added incentive to intensify his efforts. The LaGG-3’s fuselage midsection was widened and the engine mount reworked. Two variable cooling flaps on the fuselage sides and altered cooling-air baffles provided uniform cooling. Two 20mm ShVAK cannon were mounted above the engine. The machine was completed in February 1942, and Lavochkin anxiously awaited the results of its first evaluation. “The aircraft is good, pleasant to control and responsive, but the cylinder heads became hot,” reported test pilot G. A. Mishchenko. “Measures should be taken to correct this.” He also reported that level speed was 10 percent greater than that of the LaGG-3. Encouraged, Lavochkin and his team did further work on the prototype, which got its first official evaluation from May 9 to 14, 1942. Cooling and controllability problems were encountered, but with a speed of 372.8 miles per hour at its service ceiling of 21,000 feet, a climb rate of 16,400 feet in six minutes, and maneuverability that was superior to foreign as well as indigenous designs, the M-82-powered LaGG was good enough to completely reverse Lavochkin’s shaky fortunes. Since Gorbunov had left the design team by then, the new fighter was designated the LaG-5 and ordered into production, the first example rolling out of Gorky’s Plant No. 21 on June 20. Gudkov also parted company with Lavochkin soon afterward, and from September 1942 the radial engine fighters were officially referred to simply as La-5s. In August 1942 the first operational LaG-5s replaced the I-16s and LaGG-3s of the all but decimated 49th IAP on the Northwestern Front. In the course of flying their first 180 sorties, LaG-5 pilots of the 49th claimed sixteen German aircraft in the course of seventeen combats. The regiment lost ten planes, however, and five of its pilots were killed in action. Soon after the 49th IAP, fifty-seven LaG-5s were assigned to four regiments of Col. Stefan P. Danilov’s 287th Istrebitelnaya Aviatsionnaya Diviziya (IAD), attached to the First Air Army near the embattled city of Stalingrad. The Lavochkins flew their first combat missions on August 20, but they displayed the unmistakable signs of hasty production, only two-thirds of them being combat capable. One plane crashed during takeoff, while two others collided while taxiing, due to two aspects of the Shvetsov radial engine: a greater degree of propeller torque that took getting used to, combined with poor visibility from the cockpit. Again, impaired visibility compelled the pilots to fly with their canopies open, and cooling problems and lack of confidence in the retractable tail wheel resulted in flying with the cowling side flaps fully opened and the tail wheel down, all contributing to an 18.6 to 24.8 miles per hour reduction in speed. In the first three days of fighting, the LaG-5 pilots claimed eight German fighters and three bombers but lost seven of their own planes—including three to Soviet antiaircraft gunners who mistook them for German Fw 190As. Among the first standout pilots was twenty-three-year-old Lt. Evgenny P. Dranishchenko, who joined the 287th IAD’s 437th IAP on August 20 and scored his first victory, over a Ju 88, just three days later. He was credited with two Ju 88s of II./KG 76 on September 8, and by the thirteenth he scored his fifth victory in the course of ten combats. Dranishchenko’s total stood at twenty-one individual and seven shared victories in 120 missions and fifty combats when he was killed in action on August 20, 1943, exactly one year since his arrival at the front. The LaG-5’s debut yielded mixed results at best. Pilots of the 287th IAD’s 27th IAP concluded that their planes were inferior to the Me 109F-4—and, even more so, to the newer Me 109G-2 in speed and vertical maneuverability. “We have to engage only in defensive combat actions,” they reported. “The enemy is superior in altitude and, therefore, has a more favorable position from which to attack.” Concentrating on German bombers for a time, the LaG-5 pilots claimed fifty-seven of them within a month, but continued to suffer heavy losses whenever they encountered enemy fighters. Again, Semyon Lavochkin was eager to read and respond to the criticisms leveled at his fighters. For a start, he removed two of the five fuel tanks that had been intended to extend the plane’s range, but whose added weight adversely affected performance. Aerodynamic improvements, lightening of the airframe, and the introduction of the new supercharged M-82F engine resulted in a better fighter, which entered production in January 1943 as the La-5F (for forsirovanny, or “boosted”). In addition, the ninth production La-5 batch, produced in November 1942, had control surfaces of reduced area, redesigned trim tabs, and larger flaps, which improved both controllability and maneuverability. The after part of the dorsal fuselage was also lowered, and a new teardrop-shaped canopy of armored glass was installed, greatly improving visibility from the cockpit. With the subsequent introduction of the fuel-injected M-82FN engine, which boosted takeoff power from 1,700 to 1,850 horsepower in the La-5FN during the Battle of Kursk in July 1943, the curious transition of Lavochkin’s wooden “grand pianos” from “mortician’s mates” to instruments of ultimate Soviet victory was nearly complete. As the tide of war turned in favor of the Red Army, production standards would improve. Lavochkin continued to refine his now-proven design, culminating in late 1943 with the La-7, one of the cleanest radial-engine fighters of its time. Amid the heady successes that attended Operation Barbarossa, it may have been difficult for Luftwaffe pilots to imagine the V-VS recovering at all from the initial blow dealt it, let alone do so sufficiently to replace the obsolescent or flawed new fighters that they had first encountered. It would have been harder for even the Soviet airmen to imagine that the unpromising LaGG-3, or even the less than world-beating LaG-5, were steps on the way to one of the great fighters of World War II. Nevertheless, the La-5FN and La-7, which were at their best at low altitudes, did much to clear the skies over the battlefield for the Red Army’s resurgent ground forces. 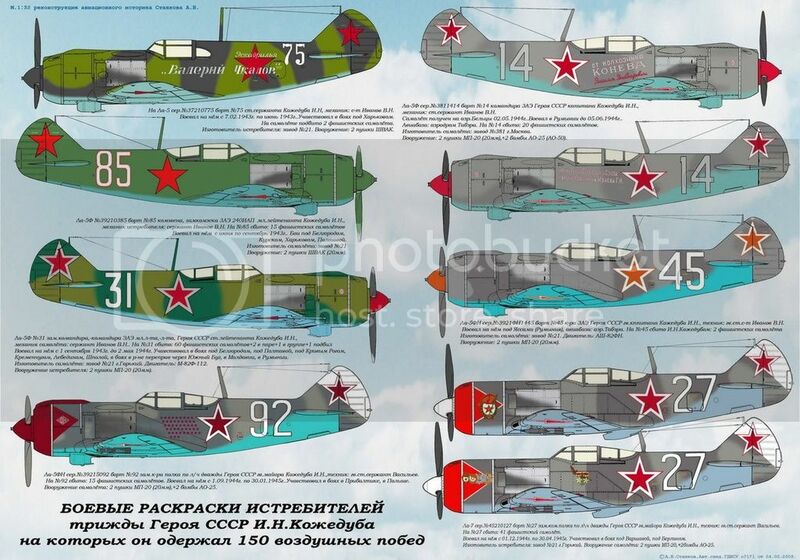 It might be added that the leading Allied ace of the war, Ivan Nikitovich Kozhedub, scored all sixty-two of his victories—including one Messer schmitt Me 262 jet—exclusively in Lavochkin fighters, from the LaG-5 to the La-7. His last wartime La-7, displaying his three HSUs, can still be seen at the Air Force Museum at Monino. The ultimate wooden Lavochkin, the La-7, was another interim design, put into production late in 1943 pending development of the all-metal La-9. Its M-82 FNV engine generated 1,850 hp and, with the air intake moved under the fuselage, the cowling was one of the most streamlined ever to enclose a radial engine. Armament was increased to three 20mm ShVak or 23mm NS cannon, which could be supplemented by six RS-82 rockets or 331 pounds of bombs on underwing racks. The La-7 had a wingspan of 32 feet, 5 3/4 inches, and was 27 feet, 4 inches long. Maximum speed was 423 mph at 20,997 feet. Takeoff weight was 7,496 pounds. Reaching the front late in 1944, the La-7 was arguably the best Soviet low- and medium-altitude fighter of World War II. Lavochkin’s final wartime variant was the La 7. This was basically an La 5FN fitted with a more powerful engine and additional aeronautical refinements. These included metal wing spars (earlier craft being made entirely of wood) for greater strength and lighter weight. The armament was also increased to three 20mm cannons that spat out seven pounds of lead per second. In an attempt to shed even more weight, the fuel capacity was cut in half, reducing the fighter’s operational radius to about an hour. However, because Soviet fighters were usually deployed right on the front lines, this was not viewed as detrimental. Lavochkin fighter craft were major contributors to the ultimate Soviet victory, and their designer received the prestigious Stalin Prize. The La-7 ended the superiority in vertical maneuverability that the Messerschmitt Bf 109G had previously enjoyed over other Soviet fighters. Furthermore, it was fast enough at low altitudes to catch, albeit with some difficulties, Focke Wulf Fw 190 fighter-bombers that attacked Soviet units on the frontlines and immediately headed for German-controlled airspace at full speed. The Yakovlev Yak-3 and the Yakovlev Yak-9U with the Klimov VK-107 engine lacked a large enough margin of speed to overtake the German raiders. Only 115 La-7s were lost in air combat, only half the number of Yak-3s.